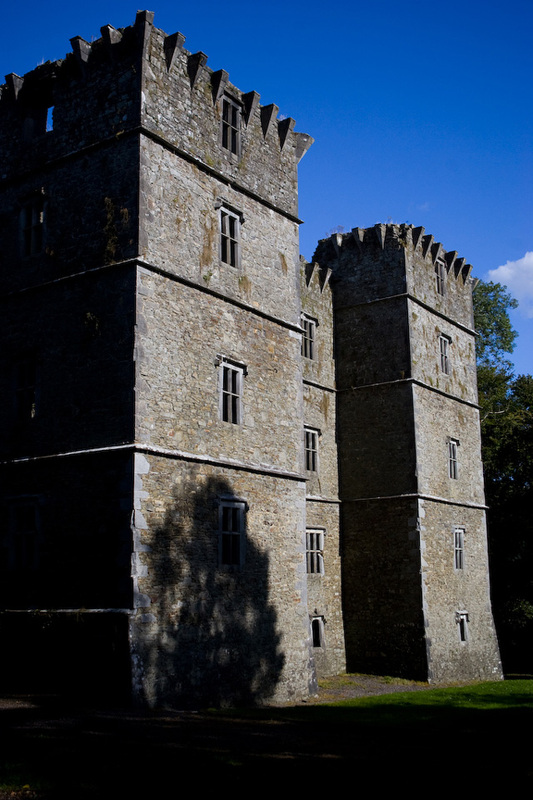 Notes: Kanturk Castle, a fortified house built in 1601 for MacDonagh McCarthy as a defence against English settlers. It was a limestone rubble Tudor mansion four storeys high, 28 metres in length and 11 metres wide, with four towers of five storeys high and a height of 29 metres. According to legend, the castle was never completed as word of its construction reached the Privy Council in England. They ordered MacDonagh to stop building works, as they feared it would be used as a base to attack English settlers. Macdonogh was allegedly so furious at this news that he smashed all the blue ceramic tiles for the roof and threw them into a nearby stream. The stream then became known as the Bluepool Stream because of the reflection of the tiles in the water. Due to its architectural and historic importance, it is owned by An Taisce (National Trust for Ireland), and is a designated National Monument. Heritage tourists from the McAuliffe, O'Keeffe, O'Callaghan, Hartnett, Fitzpatrick, Sullivan, Walsh, O'Riordan, and McCarthy families visit Kanturk to investigate familial roots in the area. As families moved during wars and the plantations, some O'Neills, O'Donnells, and other families date their roots in Kanturk from the time of the Siege of Kinsale.